Lakeside Cottage Self-cateringLakeside Cottage is a delightful purpose built property with all the comforts of home. Set in a convenient location in-between Ambleside and Windermere in five acres of grounds, well screened from the road by a stone wall and large hedge it offers a good degree of privacy. This excellent location is rural enough to feel you are in the country, yet handy enough for both Ambleside and Windermere for shopping. Lakeside Cottage is a delightful purpose built property with all the comforts of home. Set in a convenient location in-between Ambleside and Windermere in five acres of grounds, with lake access and jetty for boat mooring and launching. 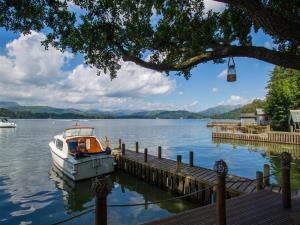 Private jetty, Lake District Visitors Centre, nearby, Lowwood Leisure Club five minute walk away. Children welcome from any age. Lakeside Cottage offers weekly bookings starting on Saturday. Lakeside Cottag offers weekly bookings starting on Saturday.